Intstrux, an independent digital marketing agency focusing on the unique needs of healthcare clients, will begin operating under the name PIXACORE. The company has also launched a new identity and redesigned Website (http://www.pixacore.com) that prominently captures the agency’s comprehensive strategy and innovative, multichannel expertise. "The reason for the name PIXACORE is we wanted our name to reflect our core, which is customer centricity. We don’t just specialize in digital strategy, we create brand strategy in a digital world that’s tailored pixel by pixel for engaging end users." “We started our business 7 years ago as a technology house that provided digital marketing solutions to our pharmaceutical clients,” said Sanjiv Mody, Founder/Chief Executive Officer of PIXACORE. “Since that time, there has been a significant evolution in the healthcare industry, customers’ consumption preferences, and the sheer number of communication channels through which people interact with our clients. We wanted our name, PIXACORE, to reflect our core, which is customer centricity. We don’t just specialize in digital strategy, we create brand strategy in a digital world that’s tailored pixel by pixel for engaging end users. PIXACORE, with its strong roots in digital, seamlessly formulates brand strategies that are fully aligned across all sales and marketing channels – CRM, CLM, Web, mobile, native apps, custom platforms, eLearning, motion design, and live events. Customers value PIXACORE’s diverse expertise to strategically guide them through today’s landscape, and its focus on R&D that will help fuel future innovations. PIXACORE features expertise in numerous healthcare categories including oncology, hematology, diabetes, cardiology, pulmonology, women’s health, and multiple sclerosis. The agency also has extensive experience in the beauty, media, publishing, automotive, fashion, education, and lifestyle industries. 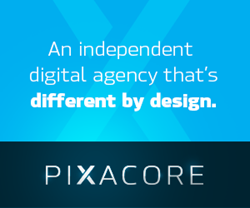 PIXACORE is an independent digital marketing agency that operates with an entrepreneur spirit, and at the intersection of strategy, creativity, and technology. Every engagement leverages PIXACORE’s diverse and passionate team of experts across strategy, user experience, analytics, motion design, relationship marketing, social, and mobile. The agency’s headquarters is located in the heart of New York City at 15 West 39th Street, New York, New York. For more information on PIXACORE, go to http://www.pixacore.com.